Are you ready for something really new and exciting? No, I mean really new. 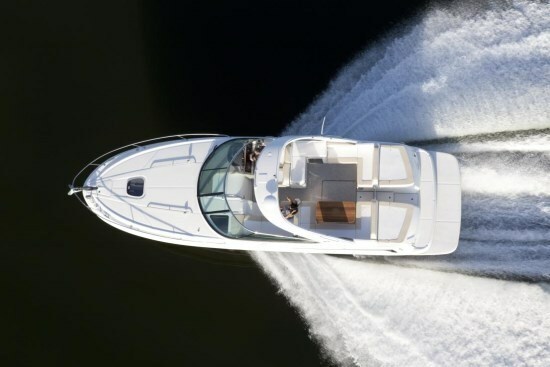 Well, sit back, relax, and let your mind open up because you’ll need all of that to wrap yourself around SeaRay’s newest and revolutionary sport cruiser offering. You read that right. 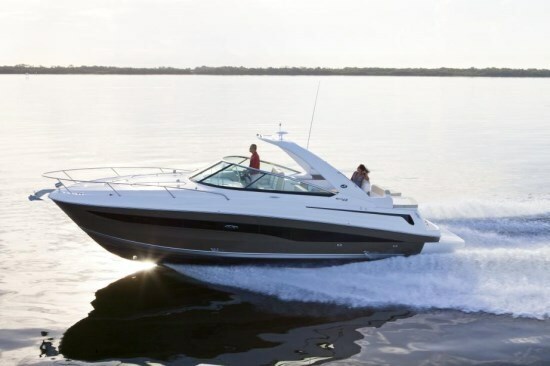 A thirty-seven foot, wide-beam, mid-cabin express cruiser powered by twin 300 horsepower Mercury Verado 4-stroke outboard motors. If you have trouble wrapping your head around this concept, you’re probably not alone. Never in the history of pleasure boat building, to our recollection, has a cruiser of this size and configuration been powered by outboards, but why not outboard power? 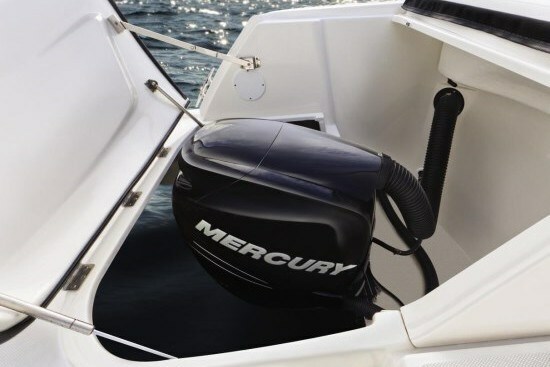 Modern 4-stroke outboards offer many potential advantages over inboard/sterndrive power in a boat this size. 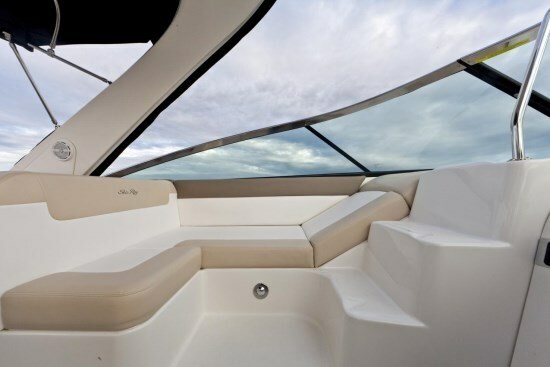 In fact, SeaRay claims that, “Overall, the amount of cockpit seating is unrivaled in the class, and when you throw the outdoor galley into the mix, the entertaining options are nearly limitless.” Indeed, the cockpit is huge. When on board, you have to keep telling yourself that this is a thirty-seven footer – not a forty or forty-four. The helm offers seating for two with dual flip-up bolsters. Opposite that on the port side is a lounger, aft of which is a large C-shaped lounge with standard solid teak table that converts to a sun lounge. Opposite that on the starboard side is an L-shaped lounge. Between these two loungers is a centre walk-thru transom gate to two sunpads above the two entirely hidden outboard motors. 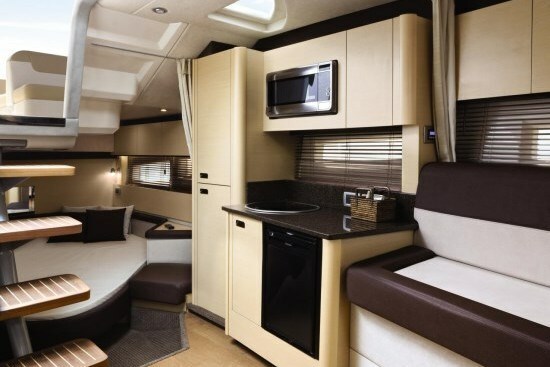 Behind the helm seat is a standard L-shaped cockpit galley with sink, stove, refrigerator, and storage. A cockpit grill is optional. With the transom mounting of the entire propulsion system, SeaRay was able to move the engine and machinery bulkhead considerably aft of its normal placement in a cruiser of this size, thus providing another obvious advantage in space utilization in the form of a huge beam-to-beam mid-cabin stateroom featuring an angled queen island berth of Visco elastic foam with storage beneath, a seat to port plus a starboard sofa lounger with storage beneath. 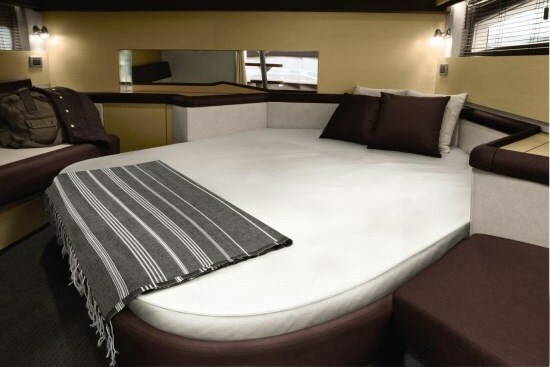 The balance of the 370 Venture’s interior from the cabin entry forward is pretty conventional with galley to port, head compartment to starboard, and a U-shaped dinette forward which converts to V-berth sleeping with a privacy curtain. The 370 Venture’s standard equipment list is very complete and includes certain items which are often optional such as reverse cycle air/heat, Mercury SmartCraft® Digital Throttle and Shift (DTS) with SmartCraft® engine Diagnostics, anchor windlass, Sunbrella® canvas enclosure, bottom paint, integral plus extended swim platform, snap-in cockpit carpet, VacuFlush® toilet, etc. 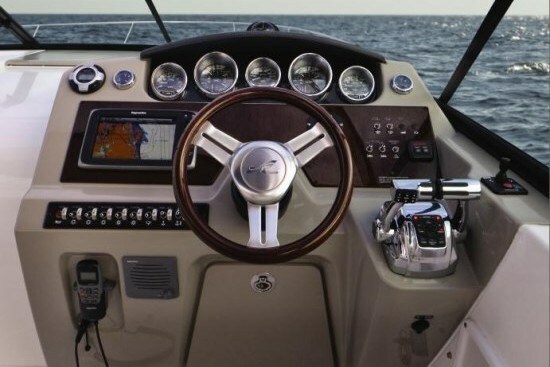 Worthwhile optional items include a 5 kW generator, Raymarine electronics packages, bow thruster, premium stereo, flatscreen TV, plus the most highly recommended option from this writer’s experience, the SmartCraft VesselView® display which integrates the electronics, engine monitoring, navigation, on-board diagnostics, and vessel status.